This continuation of FalconGuides’ progressive climbing series invites single pitch climbers to responsibly venture beyond the chains, into the realm of multi-pitch climbing. The farther from the ground a climb leads, the more technical proficiency and careful planning will make the difference between a worthy adventure and miserable epic. 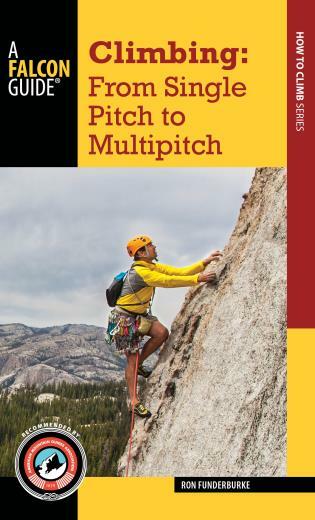 Climbing: From Single Pitch to Multi-Pitch complements instruction, ground school, and practice with a procedural approach to planning and preparation, leading anchoring and belaying, transitions, technical descent, and emergency preparedness. Before you get in way way over your head, make sure the essential skills outlined in this book have been reviewed, rehearsed, and individualized. Ron Funderburke is the Education Director at the American Alpine Club. He is an AMGA-certified rock guide, and the national discipline coordinator for the AMGA single pitch instructor program. Ron was a contributing editor on Rock Climbing: The AMGA Single Pitch Manual (Falcon), and co-author of Climbing: From Gym to Rock, Climbing: Protection, Climbing: Knots, Climbing: From Toproping to Sport, Climbing: From Sport Climbing to Traditional Climbing, and Climbing: From First-timer to Gym-climber. He lives in Golden, Colorado with his wife and sons.